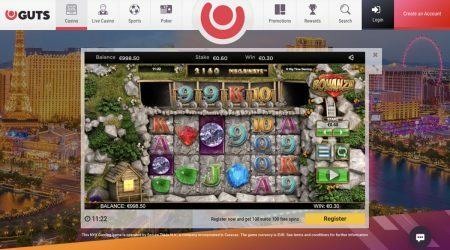 Guts Casino Review - Sign Up Today & Play for Real! Guts was launched in 2014 by a team of professional iGamers who want to run the kind of casino that they would visit. 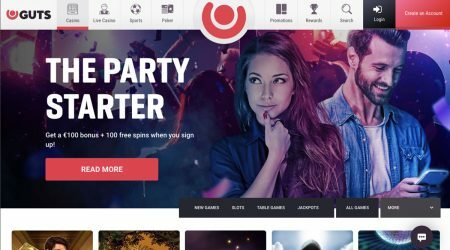 The site is licensed by the Malta Gaming Authority and also by the Gambling Commission of the UK, which should reassure potential clients of its trustworthiness. Guts has designed the service around the kind of perks that account holders most want, with super-fast withdrawals, well-trained customer service representatives, and a genuine desire to please. The games here tend to be of the best quality, with themes and styles to suit everyone. Players can browse classic casino versions of blackjack or roulette, along with virtual slots and numerous video poker options. In the live casino lounges, players can test themselves against the friendly dealers, with stakes for any budget. Players are invited to contact Guts if their favourite game is not listed, and the casino will try to obtain it. Industry legends such as Betsoft, Microgaming and NetEnt are all here, and the site’s security is exceptionally tight. Guts has plenty to offer new players who are looking for their next big casino home. However, Guts does not offer any bonuses (welcome and promotional) to UK players. For those of you who can claim bonuses, here’s how the wagering works at Guts. For the majority of bonuses at Guts, the wagering requirements are 35 times the bonus amount. This means that if a player accepts a bonus of £100, then they will need to wager £3,000 before the requirements are met and they are able to withdraw any of their winnings. Furthermore, the amount wagered is weighted differently for each type of game – for example, the Classic Slots contribute 75% and wagers from other slot games contribute 100%. Sometimes, bonuses come with different requirements, so it is always important for bettors to read through these so that they know what to expect. Guts casino games are designed to be played straight off the browser. The slots and video poker games are plentiful, but there are also lots of classic titles such as roulette and blackjack. The search tool is a great way of narrowing down a search by category, type or software provider. For people who are simply looking for inspiration, the entire list can also be displayed in alphabetical order. Guts has packed in the slots, with hundreds to choose from, and the collection can be sorted by type, provider or popularity to save time. In the Classic section, there are established favourites such as Irish Gold and Water Melon, while in the Movie section, players can try out From Dusk Till Dawn, The Dark Knight Rises and Highlander. Experienced players can challenge themselves on advanced slots, which include more complicated elements such as multipliers and wildcards. In the roulette area, Guts has included variants such as French, American and Multiwheel to keep things interesting. For card game fans, the blackjack and baccarat tables are excellent, with the chance to play against the croupier in real time for added excitement. Poker is a perennial favourite, and there are more than ten excellent-quality games for players to peruse, from Caribbean Stud and Texas Hold’em to Red Dog and many more. For players who need to build their confidence, the Video Poker platform is ideal. Blending the best of virtual and classic casino poker, it narrows down the decision-making process and places less stress on the player. There are more than 15 options, including Deuces and Joker, Jacks or Better, Joker Poker and Deuces Wild. To wind down at Guts, members can visit the Other Games section for a diverse collection of bingo, keno and scratchcard games. These less demanding titles include popular choices such as Mayan and Samba Bingo, along with Classic or Bonus Keno. For players who like to immerse themselves in paylines, the Caterpillar Scratchcard, which is based on the original slot game, has around 100. In the Live Casino section, the atmosphere feels authentic with professional-level dealers and croupiers to test a player’s skills. The look is certainly opulent, but Guts knows that not everyone has a huge bankroll to wager. This is why it has a wide range of stakes, which start from as little as 10p but go up to eye-watering maximums of over £1,000. 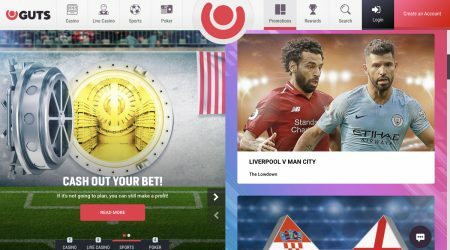 In-play is big news in the online gaming industry, and the focus at Guts is very much on this fast-paced form of live betting. 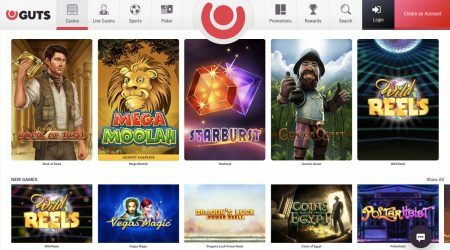 The platform is powered by software provider Microgaming and IGT among others, along with Guts’s own iGamingCloud. This diversity and expertise allow the action to move quickly and make the interface incredibly smooth. The site also looks good, with minimal clutter and each element neatly rendered. 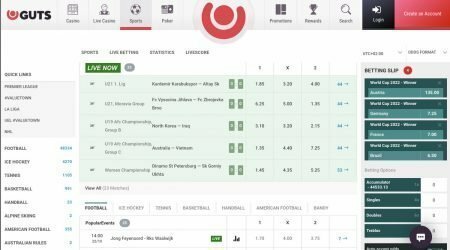 The prices and odds are not brilliant, but they’re certainly not bad either, and there is a massive range of wagers and sports markets to explore. More than 20 key markets include tennis, cricket, basketball, football, golf and baseball. For the larger markets, there are up to 50 different wagers on an individual fixture. The minimum stake is a modest 50p, so players do not need to arrive with a huge balance every time they visit the sportsbook at Guts. People are always cautious when it comes to making payments to new companies, but when a casino uses familiar methods of payment, they tend to feel less concerned. To protect each financial transaction on its website, Guts uses the latest encryption technology and only chooses the most reliable payment methods for their customers to use. In the UK, members can make a deposit using credit cards such as Visa or Mastercard, along with Trustly, paysafecard, Neteller and Skrill. If you prefer to pay by another method, then the company is open to suggestions. Guts frames itself as a casino that listens to account holders and takes up their suggestions. The company regularly reinforces its dedication to keeping clients happy and provides a 24-hour chat line to back this up. The site doesn’t just look young and contemporary, but also boasts some of the most innovative software around from top providers and delivers a lag-free experience over mobile and desktop. Better still, the selections are great in each area, with plenty of choice in Casino Games, Slots, Live Casino, Sports and Poker. Plus, there is a suite of promotional offers tailored to each section – so whatever a player’s preference, they won’t miss out. 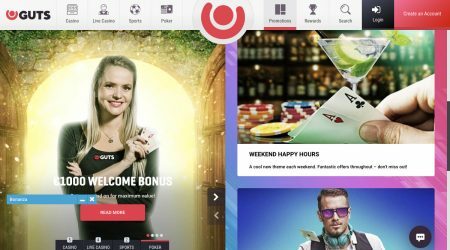 With regulation from the Malta Gaming Authority and also from the UK Gambling Commission, it’s clear that Guts is a genuine casino with a responsible attitude, and it also provides a sense of fun.